In this post, I will show how to integrate Apache Tiles 3 with Spring MVC. One of the areas in which Spring MVC has advance compares to other frameworks is in the separation of view technologies. 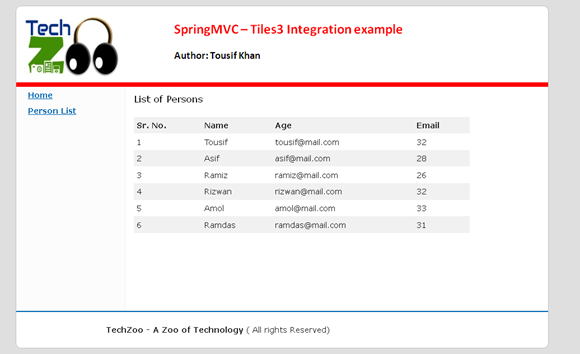 In this post, i will show how to integrate Apache Tiles 3 with Spring MVC. Apache Tiles is a free open-source template engine for java web frameworks. It’s based on Composite pattern and used to simplify the development of user interfaces. Create a spring configuration XML file which add bean definition for TilesConfigurar and TilesView. Now create a tiles definition xml file which contains tiles template definitions. I have created two xml files, one for tiles base template and another for tiles body definition but you can combine it in one. 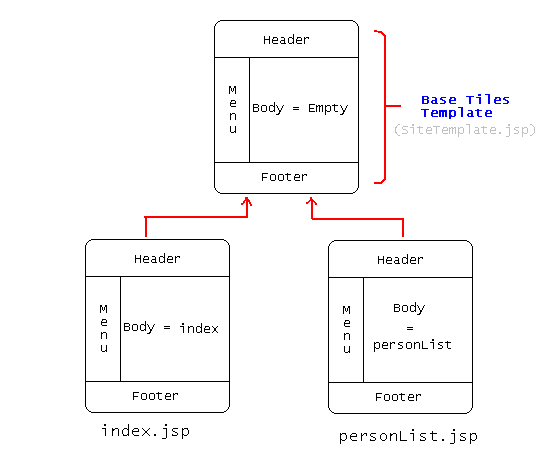 Create a template jsp which include the common pages (like header, footer, menu etc.). I have used Blueprint css framework to create a grid for layout. As you can see, In you main template jsp we have inserted body attribute but in tiles-def xml file that body attribute is blank. This is because spring controller will render this portion using its view rendering mechanism. Create a Controller which has two action (index and viewPeson) . The return value of every controller will be mapped with each tiles definition which is associated with jsp to render as body in template. A Person VO class just to show a list of person in personList.jsp. Your second tiles defination xml (views.xml) will looks similar to following. Both the tile defination ‘index’ and ‘personList’ is extending ‘DefaultTemplate’. Published at DZone with permission of Tousif Khan , DZone MVB. See the original article here.